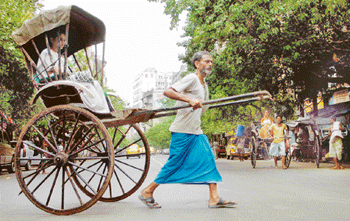 This Independence Day marked the dawn of freedom from indignity for the rickshaw-pullers in Kolkata. Attempts to pack off the hand-pulled rickshaw had failed on earlier occasions but this time the West Bengal Government is determined to see the ban through. Subhrangshu Gupta looks at ‘human horses’ that ferry people and wonders if it will be a final goodbye to the hand-pulled rickshaw. The hand-pulled rickshaw is to disappear from the streets of Kolkata, the last big Indian city to still have spindly-legged, rag-clad men straining to earn a few paisas a day carrying passengers. As we drove along the narrow, water-logged road of the Kohora range of Kaziranga National Park in Assam, little did we know that we would soon be face to face with the famous one-horned rhino. The 15-centuries-old city of Ajmer in Rajasthan reminds most people only of the famous dargah of the Sufi saint, Khwaja Moinuddin Chisti, which attracts lakhs of devotees from all over the world. Cricket and cinema are two passions that ignite and unite Indians. Both are about big bucks and big-time fame. Their combination ought to be unbeatable. Look at those celebrity couples — Tiger Pataudi and Sharmila Tagore, and Mohammad Azharuddin and Sangeeta Bijlani. Kay Kay Menon does not possess the airs of an overnight star. But that personality trait has nothing to do with the fact that the one-time theatre actor’s climb up the Bollywood ladder has been somewhat slow and arduous. televisioN: Is Tulsi finally wilting? by Chaman Nahal. Roli. Pages 285. Rs 295.
by Uma Vasudev. Shubhi. Pages 350. Rs 495.
by Atul Vashistha and Avinash Vashistha. Tata McGraw-Hill. Ed Arpit Rajain. Sage Publications, New Delhi. Pages: 495. Rs 480. Ten Best Sci-Fi Stories by Jayant Narlikar. Witness Books, Delhi. Pages 216. Rs 250.
by Chetna Keer Banerjee. Rupa. Pages 24. Rs 50. Azad Publications, Ludhiana. Pages 233. Rs 200.
by Jagman Singh. Oxford & IBH Publishing Co (Pvt) Ltd. Pages xi+612.